Create Without Boundaries. Produce Without Limits. 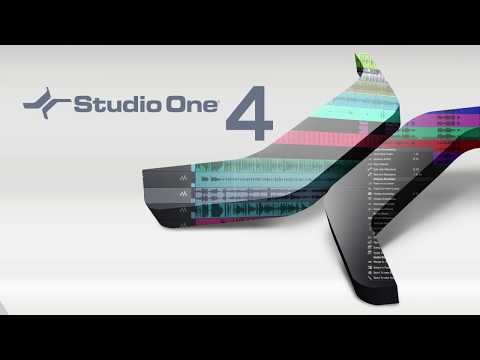 Studio One 4: Work better, faster. This is an upgrade for customers with any version of Studio One Producer / Professional. So yes, that means even from Studio One version 1! Studio One® 4 was designed with ease of use at its core. It seamlessly combines the time-tested and proven recording studio model with today’s beat- and loop-oriented production process so you can bring musical ideas to sonic reality more quickly than ever before. An efficient, single-screen interface houses an unlimited number of tracks, intuitive editing tools, and advanced virtual instruments. Spend your precious time creating music instead of wondering what to click next. Studio One doesn’t dictate how you work or what you work on. Three Creative Paths, One Goal. Studio One is your creative companion from start to finish. The Start page provides what you need to kickstart your creative process—open projects, set parameters, and check for updates and tips. From there, the Song page is all about recording, arranging, editing, and mixing your music with a complete set of virtual instruments, effects, and groundbreaking arrangement tools. Then, assemble and master your music in the Project page. Even better, the Project and Song pages are linked so if you need just that one little change in your master or stems, switch to the Song page, tweak, and mix back automatically to the Project. No other program accomplishes such an effortless transition as you move from the initial creative inspiration to the finished, mastered production. Arranging at The Speed of Click. Forget laborious transposition, cutting, pasting, and moving when arranging. With Scratch Pads to test out arrangements, an Arranger track that makes moving sections of songs around as easy as moving parts, and the groundbreaking Harmonic Editing—the most flexible chord track implementation ever—no other program can approach the ease of arranging and songwriting that Studio One 4 delivers. Another Studio One First: Harmonic Editing. Far more than just a simple chord track for note data, Studio One 4’s Chord Track is a songwriter’s dream come true. Create and change chord progressions, try out chord substitutions, substitute rich chords for simple ones, even have older parts follow a new, better chord structure you came up with thanks to the inspiration Harmonic Editing can provide. This breakthrough, which works with instruments and even audio tracks, underscores Studio One’s commitment to streamline the songwriting and music creation process. When you come up with an inspired chord progression, you needn’t put your creativity on hold while you figure out what you played in order to add new parts. Built-in chord detection extracts chords from audio or instrument tracks—simply drag a part to the Chord Track to create a reference for Harmonic Editing. When you’re stuck in a rut, let Studio One Professional be your creative partner. Use the ingenious Chord Selector to experiment easily with new chord patterns and ideas. Let Harmonic Editing spark new ideas. Change chords in real time from an external MIDI controller to try out chord progressions on the fly. Transfer chord data from an audio or instrument track to the Chord Track, or from the Chord Track to other tracks. Printable Notation That’s Truly Noteworthy. With just a few clicks and Notion 6.4 or higher, Harmonic Editing makes it easy to create great-looking, printable lead sheets. Studio One works with all the standard MIDI gear you know and love, from controllers to tone modules. But once MIDI data arrives into Studio One, it’s converted to a high-resolution, 32-bit internal format. That means no zipper noise on instruments, smoother controller changes and pitch bends, more detailed automation, and other benefits when working in the Studio One environment. And if you need to drive external MIDI gear, you’re covered there too—Studio One translates its high-resolution format back into standard MIDI data if it needs to return to the outside world. With its rich roster of native plug-ins, Studio One has earned its reputation as a complete production package—and now our latest generation of virtual instruments, based on input from the Studio One community (thank you), deliver even more. Impact has been remade into Impact XT, a comprehensive beat and rhythm production environment. Sample One XT samples, slices, and dices to create great beats and realistic instrument sounds. These new instruments don’t feel like separate plug-ins but like integrated—and integral—parts of music creation. Meet your new creative partners. Impact XT: Heat up The Beat. Fully backward compatible with Impact, the XT version adds more than 20 new, highly requested features and improvements. You can even create complete arrangements in a single instance of Impact XT by launching loops that sync to your Song with real-time stretching, beat quantization, and synched start/stop. Sample One XT: Because Samplers Should Sample. Sample One XT has expanded from sample playback into a sampling powerhouse. Sample, auto-slice, stretch, process, trigger, and deconstruct audio (sampled from inputs or imported from a track) for breathtaking freedom in constructing powerful new performances and beats. Studio One 4 isn’t just about including a world-class drum instrument but also integrating it with an innovative, streamlined Drum Editor to edit drum parts as fast as you can think. Along with hundreds of preconfigured pitch name and mapping scripts available for free from PreSonus Exchange, the new Drum Editor is like an accelerator for drum editing. The step sequencer has served us well for over half a century; now it’s time for Studio One’s new Patterns to step into the future. Tight integration with instrument parts, automation, and Impact XT means that Patterns reinvent step sequencing as a seamless, fast, fun part of making music. From Dumb Machine to Drum Machine—and More. Patterns transform step sequencing from mechanical repetition into a truly expressive addition to modern sequencing. Yes, Patterns are about drums… but also melodies, integration with any instrument, step-based automation, variable sequence lengths (polyrhythms, anyone? ), unlimited variations, and more. Extra Functions. No Extra Complications. Impact XT’s integration with Patterns will change how you think about drum programming because the combination makes beat creation fast, fun, and effortless. There’s no need for a separate plug-in or track type to do pattern-based sequencing because Patterns work side-by-side with conventional Instrument parts on the same track. You can choose, rename, copy, and reorder an unlimited number of Pattern variations from within the Arrangement—you don’t even need to open the Pattern Editor. And, there’s a new library of inspirational drum Patterns and Variations Patterns in the Musicloops format for easy, drag-and-drop saving and export. Studio One Professional is the only program that links songs and stems with finished, mixed Projects. Transfer mixes or mixed stems to the Project page for mastering—but if you hear anything you need to change, simply jump back into the Song, make your tweaks, and then mix the revised version back automatically into the Project page to continue mastering. Whether for Red Book-compatible CD burning, digital publishing for streaming, creating DJ sets and playlists, or professional-level DDP import/export for duplicators, the Song page/Project page partnership makes it easy to obtain consistent levels and tonal balance with collections of songs. Processors for The Mastering Process. Sweeten your project and prepare it for prime time—Studio One 4’s professional mastering features include sophisticated equalization, limiting, industry-standard metering, spectrum analysis, and analytic plug-ins to help add the all-important final touches to your music. Apply processing to individual tracks, or the entire collection, to take your mixes to the next level. Pick a Format… Any Format. Prepare your tracks for streaming with data compressed, standard, or lossless files. AAF (Advanced Authoring Format) provides song/session exchange for those who haven’t switched to Studio One (yet). Open all video and audio formats your operating system supports. Enjoy better video performance with 64-bit video engines for macOS and Windows. Create disk images. Burn Red Book CDs. Import DDP files for editing, such as fixing ID tags or ISRC code errors, then export the corrected DDP file. Whether your music’s final destination is online streaming or physical media, Studio One Professional has you covered. Breaking News: ARA 2.0 is Coming. Deep support for the new Audio Random Access 2.0 spec opens Studio One 4’s groundbreaking Harmonic Editing to other plug-in and virtual instrument developers (expect a free Melodyne update with Chord Track support later this year), and allows simultaneous editing of multiple tracks. • 2 GB RAM minimum (4 GB RAM or more recommended). Tablet must be x86-compatible (not ARM-based).